Pyruvate dehydrogenase complex. Flexible linkers, which are not included in the atomic coordinates, are shown schematically. A combination of crystallography, NMR spectroscopy and electron microscopy is revealing the secrets of pyruvate dehydrogenase complex. The complex performs a central step in energy production, catalyzing the reaction that links glycolysis with the tricarboxylic acid cycle. The reaction is performed in three separate steps by three separate enzymes, but all three enzymes are linked efficiently together into one large multienzyme complex. The complex has many moving parts that work together to perform the overall reaction. It is built around a symmetrical core, shown here in blue. Each of the protein chains in this core has a long flexible tail which folds into several additional functional domains. 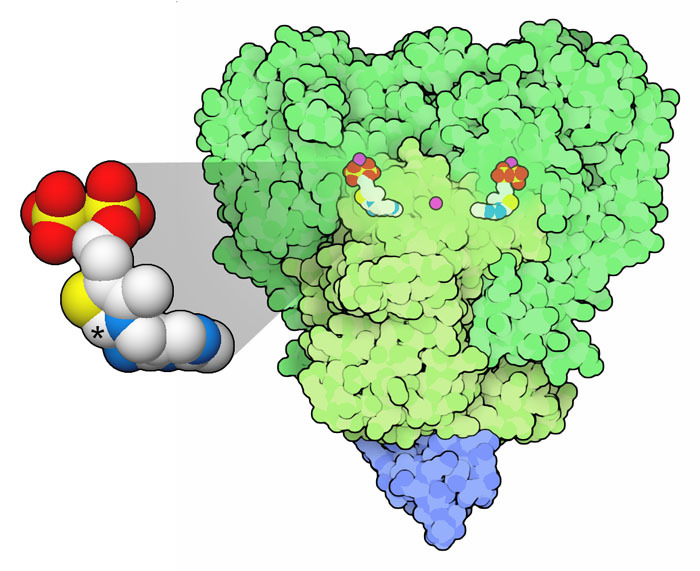 One of these domains grabs the other enzymes in the complex, shown in green and yellow/pink. There are also several small domains that act as carriers. A lysine amino acid on these domains (shown in magenta) is attached to a special carrier molecule, lipoic acid (not included in the structure). It delivers the molecule being broken down from enzyme to enzyme during the reaction. Note that this illustration is highly simplified: only 6 of the 24 tails are shown. In the actual complex, the center core is completely surrounded. Since the overall complex is so flexible, it has been difficult to study. Structural biologists have taken a divide-and-conquer approach, and broken the complex into small pieces that are amenable for study. Pictures of the whole complex from electron microscopy are then used to figure out how to reassemble all the pieces. 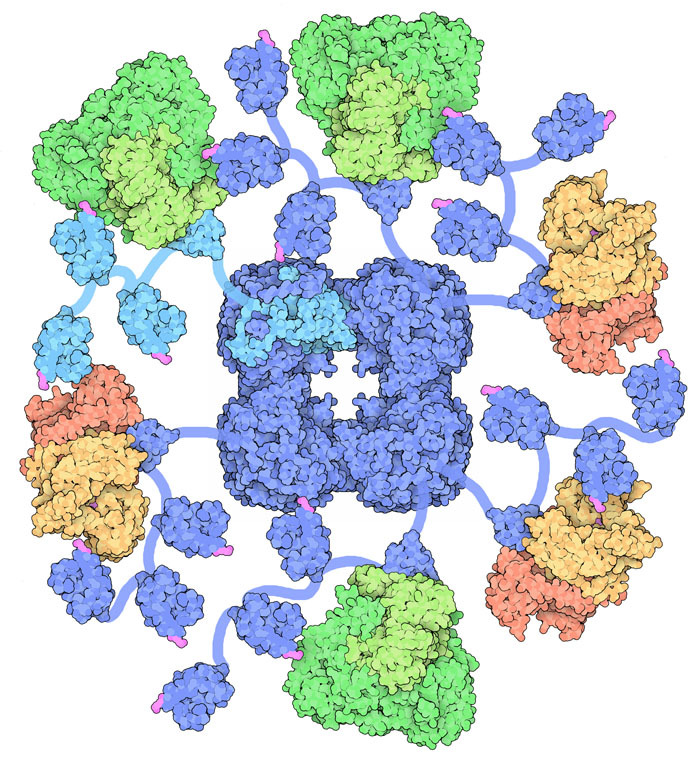 Several structures are included in this illustration: the central core (1eaa ), the carrier domains (1lac ), and two enzymes bound to the linker domains of the flexible tail (1w85 and 1ebd ). E1 subunit of pyruvate dehydrogenase (right) and thiamine pyrophosphate (left). The reactions performed in this complex are tricky, so several specialized chemical tools are used by the enzymes. The enzyme that performs the first step, shown here from PDB entry 1w85 , uses thiamine pyrophosphate to extract carbon dioxide from pyruvate. The thiamine molecule has a particularly reactive carbon atom, shown here with a star, which assists with the reaction. Other chemical tools are also needed in the complex: the little carrier domains need lipoic acid to hold tightly to the acetyl groups that are produced by the first enzyme, and they ultimately transfer them to another unusual chemical carrier molecule: coenzyme A. The enzyme that performs the last step requires FAD and NAD to perform a restorative reaction on the lipoic acid. Our cells are not able to build several of these complicated chemical tools from scratch, so we need to obtain these molecules as the vitamins thiamine, pantothenic acid, riboflavin and niacin in our diet. As is often the case in biology, things get even more complicated when you look closer. There are many variations on this basic structure in different types of cells. Some cells have one or two carrier domains on the little tails instead of the three shown here. The complex in our cells also includes another protein in the core, with its own carrier domains. 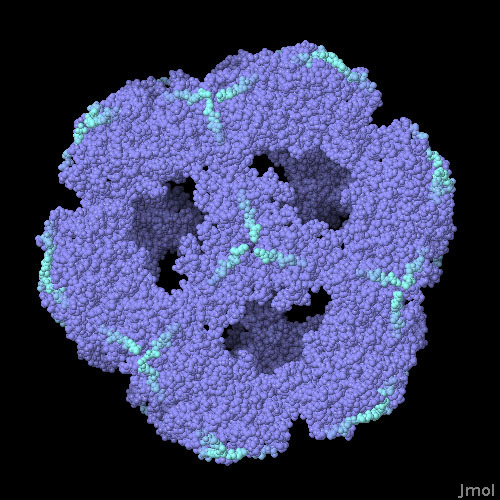 Also, the core itself can have different geometry: a cube-shaped core composed of 24 subunits or a dodecahedral core composed of 60 subunits (shown here from PDB entry 1b5s ). To explore both of these types of cores, click on the image for an interactive Jmol. More and more proteins are being discovered that include several functional domains connected by flexible linkers. Can you find other examples in the PDB? In the PDB, you can find many different enzymes that use cofactors derived from vitamins such as thiamine, niacin, and riboflavin. Do they all perform similar functions, or are the cofactors used in different ways? D. L. Nelson and M. M. Cox (2008) Lehninger Principles of Biochemistry. Worth Publishers, New York. X. Yu, Y. Hiromasa, H. Tsen, J. K. Stoops, T. E. Roche and Z. H. Zhou (2008) Structures of the human pyruvate dehydrogeanse complex cores: a highly conserved catalytic center with flexible N-terminal domains. Structure 16, 104-114. T. Izard, A. Aevarsson, M. D. Allen, A. H. Westphal, R. N. Perham, A. deKok and W. G. J. Hol (1999) Principles of quasi-equivalence and Euclidean geometry govern the assembly of cubic and dodecahedral cores of pyruvate dehydrogenase complexes. Proceedings of the National Academy of Sciences USA 96, 1240-1245.